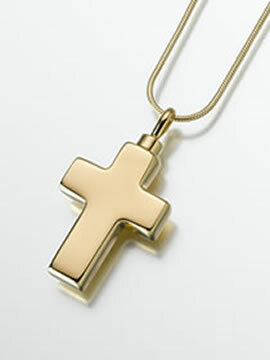 Large Cross Keepsake Urn is available in Sterling Silver or Gold Vermeil. Vermeil urns are plated with 100 milligrams of gold, the best grade of plating. A 24" black satin cord is included unless you choos the option of purchasing a sterling silver or gold vermeil chain. This pendant measures 1 1/2" tall x 1" wide. A screw top opening makes it easy to add a bit of hair, some crushed dried flowers, sacred ground, or a small amount of cremains. In order to avoid tarnishing, a layer of silicone is applied to each pendant. A small funnel, filling instructions, care instructions, and gift box are included.